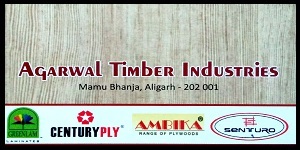 The Owner of the organisation Mr.Sanjay Agawal (MD).Is Agarwal timber Industries was founded in 1960.our organisation Agarwal Timber Industries is very famous for all types of timber which is not availabe in all ouer Aligarh that we have kept. 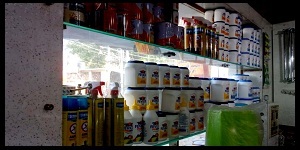 All the peoples of Aligarh get all types word |Doors |plywood color and texture etc. can find in native city. Agarwal timber is provides to customer furniture wood in many color and texture.Whether it's home furniture OR office Furniture. And we have found that each type of wood has it's own individuol characterstecs, grain and color which distinguishes one type of wood form anothr. check out the various wood types for making different furniture below. Color- Basswood,Beech,Yellow Birch,Butter cedar , Cherry,Eim,Gum,Hickory,Lauan,Manogany,Maply,Red,Oak,White oak,Pink. Recongnition- Wood Land - The Wood Is multipurpose and Enlarges the variety of merchandise offered by many companies of the wood. 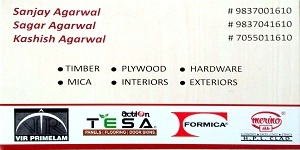 In AGARWAL TIMBER INDUSTRIES ,Wood for Interior decorating and products of the Industry of wooden materials such as well as for stairs and frames. 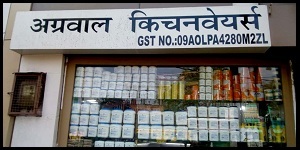 Connect 2 All People is an intiative to simplifydoing global trade from and with India .We are working towards our vision to "Make it safe & simlpe " for anyone.We aim to make connect 2 All people as single stop source for meeting all you trading requirements in Aligarh. We provide to our customer better product and services on market demand ,All at single place .The end goal is to making doing trading simple and safe. Always Feel Free To Contact Us.